It was announced today that Elizabeth Blackburn, Carol Greider and Jack Szostack won the Nobel Prize in Physiology or Medicine for their "discovery of how chromosomes are protected by telomeres and the enzyme telomerase." While the winners' biochemical studies have been extremely important in our understanding of how cells divide, what has caught the attention of science fiction writers is the role that telomeres - or more precisely the loss of telomere sequences - plays in the process of aging. When Watson and Crick figured out the double-helix structure of deoxyribonucleic acid, or DNA, one of the cool aspects of their model was that the structure immediately suggested how identical copies could be produced when cells divide: the two strands of DNA could "unzip" and be used as templates to create a new double strand. Research into the actual biochemistry of DNA replication, however, discovered a problem. The enzymes that synthesize the duplicate strand of DNA - DNA polymerases - can only add nucleotides onto an existing nucleic acid sequence called a primer, which is made of RNA, rather than DNA. When the DNA sequence that is being duplicated is a circle, like most bacterial chromosomes, the head of the growing DNA strand eventually meets up with its tail, completing the sequence. However, the DNA in the nuclei of eukaryotic cells - which includes fungi, plant and animal cells - is packaged into large linear chromosomes. Consider that every human starts out as a single cell but ends up with an estimated 10 trillion (1013) cells after many many cell divisions. If your chromosomes shrank every time a cell divided, they would be severely truncated by the time you were ready to pass on your DNA to your offspring and any functioning genes located near the ends of the chromosomes would be lost. What chromosomes clearly needed is something to protect its ends during replication, and that "something" turns out to be a telomere. A telomere is a short DNA sequence on the end of the that is repeated many times and folds into a three-dimensional structure that protects the ends of chromosomes. Nobel winner Blackburn had compared telomeres to the plastic tips that prevent shoelaces from fraying. Imagining biological aglets paints a pretty decent picture of what telomeres do, but doesn't really capture the dynamic nature of chromosome structure. An enzyme called telomerase can extend the repeating telomere sequence, but telomerase is absent from most adult cells, so a bit of the telomere sequence is lost every time a cell divides. Once its telomeres become too short, a cell loses its ability to divide and either ages or self-destructs. If all that seems too complicated to visualize, check out this nice animated tutorial on "Solving the End-Replication Problem" or watch Elizabeth Blackburn's excellent recent lecture on telomeres and aging. So how has telomere research been adopted into science fiction? I've looked at a couple of examples below. "Look at me," said McGavin, spreading his arms again. "I'm sixty-two years old, according to my birth certificate. But my cells, my telomeres, my free-radical levels, and every other indicator say I'm twenty-five. And, if anything, I feel younger even than that." Don's jaw must have been hanging open in surprise. "You thought I'd had a facelift, or something like that?" McGavin said, looking at him. "Plastic surgery is like a software patch. It's a quick, kludgy fix, and it often creates more problems than it solves. But rejuvenation, well, that's like a code rewrite — it's a real fix. You don't just look young again; you are young." His thin eyebrows climbed his wide forehead. "And that's what I'm offering you. The full-blown rejuvenation treatment." A natural extrapolation from the correlation between the shortening of telomers and aging is that artifical means of keeping telomeres long would reverse - or at least halt - the aging process. That is one of the premises of Robert Sawyer's 2007 novel Rollback, in which the characters undergo anti-aging Rejuvination treatments that includes telomere lengthening. At least that's what the treatments are meant to do. "We did succeed in lengthening your telomeres, Sarah, but for some reason the new endcap sequences are just being ignored when your chromosomes are being reproduced. Instead of continuing to transcribe all the way up to the end of your DNA, the replicator enzyme is stopping short, at where your chromosome arms used to end." I'm finding it hard to imagine how DNA replication would not occur in extended telomeres and be limited to the exact end of the original telomeres, since the extended telomeres should just be repeats of the same DNA sequence1, at least the way I would do it. The easiest way to extend telomere length is by increasing the activity of the enzyme telomerase. Scientists at the biotech company Geron, for example, have shown that expression of telomerase in adult human cells can signficantly increase the life span of those cells in culture. Extending that to "cure" human aging has been suggested by others, and is not surprisingly the claimed mechanism of action of overhyped so-called "neutraceuticals" currently on the market, as well as some anti-aging drugs that are apparently in development. It's important to keep in mind, however, that there is a potential downside to allowing cells to divide indefinitely. The adult cells that do express telomerase are usually tumor cells. That's not particularly surprising, since one of the characteristics of cancer cells is that they keep dividing when they aren't supposed to be. While introduction of telomerase can immortalize human cells in culture without causing changes associated with cancer cells , transgenic mice with increased telomerase expression only show an increased lifespan if they don't die from tumors during their first year of life. I don't think that would be acceptable for a human therapeutic treatement. So while telomeres are an obvious target to increase human longevity, I think we're a long way from safe and practical anti-aging treatments. 1. I haven't read Rollback beyond a few excerpts, so the speculation is all mine and not reflective of the what's in the novel. But to get all pedantic, that a particular passage seems to muddle the action of DNA polymerase enzymes, which replicate DNA, telomerase, which is a reverse transcriptase (a DNA polymerase that uses an RNA template), and "transcription" which is the synthesis of RNA using a DNA template (i.e., not DNA replication). I guess it all sounds good and sciency if you aren't familiar with the terminology. Or maybe there's a better explanation in the text. Clearly I need to put Rollback on my "to read" list. While it it's been well established that telomeres get shorter as cells divide and an individual gets older, it wasn't until fairly recently that it was demonstrated that telomere shortening appears to occur at a predictable rate. In 2002 scientists at Kyushu University in Japan published a method of roughly estimating human age from DNA samples (see Tsuji et al. (2002) doi:10.1016/S0379-0738(02)00086-5). That's a nifty scientific device to determine an individual isn't the age he claims to be - say, for example if the character turns out to have been (dun, dun, dun) cloned from an adult cell. The logic goes like this: as people age, their telomeres get shorter. When a clone is made by transferring the nucleus of an adult cell into an egg, the telomeres are presumably at their adult length, rather than the longer length found in embryos. As the clone ages, its telomeres would always be shorter than uncloned individuals of the same age. 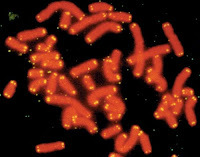 Not only would the shorter telomere length give away the fact that the individual was a clone, but the clone's life would be shortened because his cells would stop dividing at an earlier age. Science fictionally, that was the scenario used on Stargate Atlantis. In the episode "The Kindred" the Stargate Atlantis team discovers an imprisoned Dr. Beckett. That wouldn't have been particularly remarkable if Beckett hadn't died heroically several years before. The man they found looked like Dr. Beckett, had the memories of Dr. Beckett and even was genetically identical to Dr. Beckett - except that his telomeres were 30% shorter than they should have been for a man his age. Sadly, his cells are also rapidly degenerating so that he needs to be kept in stasis until the plot team really needs his help. 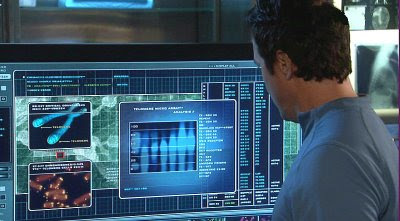 Clone Beckett looks at the analysis of his DNA. Now that we've been cloning mammals for more than a decade, we can ask if that scenario is plausible. The first mammal cloned from an adult somatic cell, Dolly the sheep, did indeed have shorter telomeres than expected for her age, and she died young. However, that doesn't seem to hold true for all other cloned animals. There is evidence from cloned pigs and cloned cattle, for example, that the presence of telomerase enzyme during embryonic development can rejuvinate the length of telomeres in clones. And it's still unclear whether Dolly's shorted telomeres played any role in her death. And to complicate matters, telomere length isn't only dictated by age. For example, psychological stress has been shown to reduce telomere length to the equivalent of 10 years of aging, and men generally have shorter telomeres than women of the same age. While telomeres may be a good measure of an individuals physiological age, I suspect that they will never provide more than an approximation of chronological age. So to sum it all up: telomere length can affect both the aging and health of cells, in ways that aren't entirely understood. Ideal science fiction fodder! Are clones like cheap knockoffs? Top Image: Crystal structure of parallel quadruplexes from human telomeric DNA. 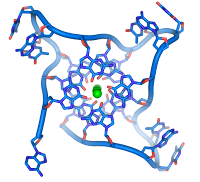 The DNA strand (blue) circles the bases that stack together in the center around three co-ordinated metal ions (green). Produced from NDB ID: UD001 by Thomas Splettstoesser for Wikipedia. 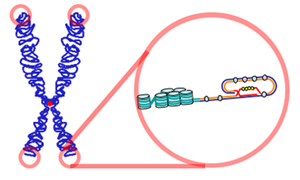 Middle Image: Cartoon of a telomere forming a loop at the end of a chromosome. From Wikipedia. Middle Image: Chromosomes with telomeres stained yellow. From the Human Genome Program, US Department of Energy, 1997. Bottom Image: Clone Beckett looks at the analysis of his telomeres. Screen grab by Crystal @ Perspective. Thank you! This was fascinating. It's worth noting that 1) Greider was Blackburn's grad student but Blackburn shared the glory (unlike several male recipients) and 2) Blackburn was the scientist who got fired from the Bush "bioethics panel" for daring to inject some reality into the stem cell debate. Dr. Blackburn was my undergrad adviser and quite awesome some 25 years ago too. One overlooked aspect of her is shown in an article in Discover Magazine (http://discovermagazine.com/2002/nov/featadapt). I have to say that I can't imagine a more adept candidate for a Nobel prize!